Soil with broken rock fragments overlying bedrock, Sandside Bay, Caithness. In stratigraphy, bedrock is the common term for solid rock under the surface of the Earth. Above the bedrock is usually an area of broken and weathered rock, soil, sand, pebbles, etc. 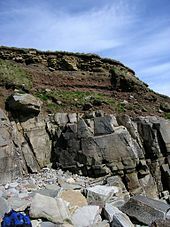 The top of the bedrock is known as the rockhead and identifying this, via excavations, drilling or geophysical methods, is an important task in most civil engineering projects. Loose material on top (known as drift) can be extremely thick, so that the bedrock lies hundreds of meters below the surface. A 'solid' geologic map of an area will usually show the rock that would be exposed at the surface if all soil or other superficial deposits were removed. ↑ "Swinford,E.Mac What the glaciers left behind - drift thickness map of Ohio, Ohio Department of Natural Resources, Division of Geological Survey, newsletter 2004, No.1" (PDF). Retrieved 2012-09-12. ↑ BGS. "Digital Geology - Bedrock geology theme". Archived from the original on 13 December 2009. Retrieved 2009-11-12. This page was last changed on 30 August 2017, at 21:44.